CAS-ual Friday's Pretty in Pink challenge!!! I used PTI stamps and some washi tape for this card. 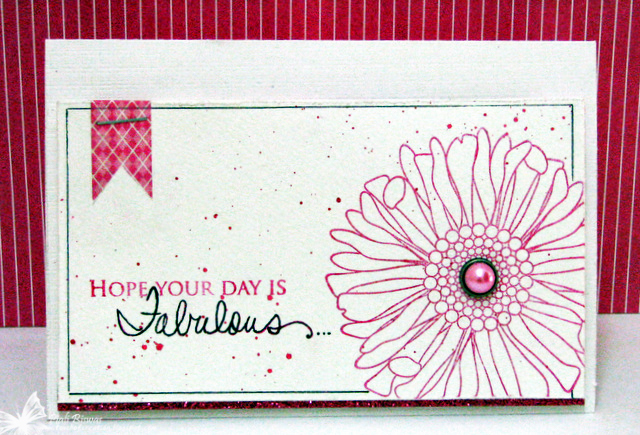 A few ink splatters here ,a strip glitter paper of and there and bright pink MME brad...simple embellishments. CAS-ual Fridays- Pretty in pink. Fab 'n' Funky : Cute and girly. Spatter Technique Challenge in the Moxie Fab World: splatters. 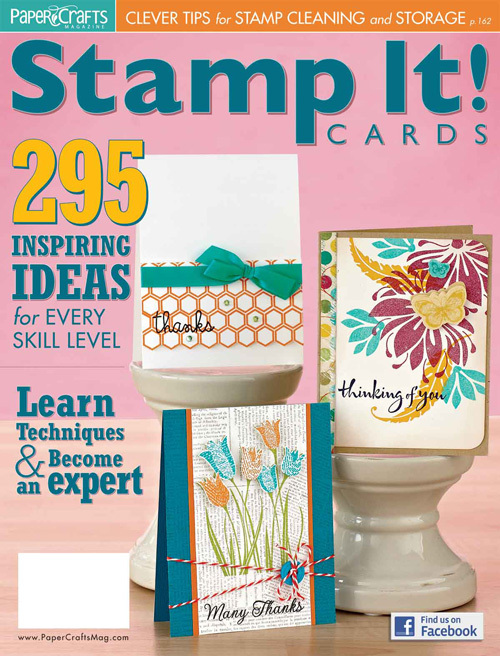 Did you get a chance to see the AWESOME New Papercrafts Magazine- Stamp It Cards!!! I'm so loving all the MFW and PC blog posts and challenges! 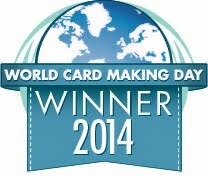 I've two cards in it...can't wait to get my copy! I'm Alive!!!!............ I'm still here!!!! YEP!!!! I still exist on this Earth!! Sorry for the long bloggy break...I had a family emergency! On May24th I got a call from my mom ....my dad was rushed to the emergency. Within few hours flew to my hometown with the kids! It was a tough one , it took way longer than usual...... after ten days he came back home! After a day I had to rush him to the emergency again.... it was a case of heart failure!! He again had to go for ANGIOPLASTY....I really felt so bad for him, he was in so much pain! We all were so worried! Poor my mom she is so sick herself( she needs Dialysis three times a week) and all the stress made it worst! Unfortunately the procedure was only half successful! Finally , Dad came back home now! He is on strong medications and the doctors are hoping he will be back to his normal acitivities after few months! I hope everything works out fine...both my parents stay healthy! Did you all know that JUNE is my blog Anniversary month???? YES!! It is...its my 3rd Blog Anniversary!! I met the most awesome group of crafters from allover the world!! I got to share my work with lots of talented DTs! I got my work published in some of best Magazines of the Industry!! above all I made lots of GOOD Bloggy FRIEND on the way!! So I've 3 GIVEAWAYS for all my lovely blog readers!!! A package full of Stamps & Quickutz die!! 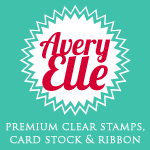 A package full of embellishments & Washi Tapes! A package full of Glittery Goodness!!!! I'll pick three random winners for these goodies! This candy is open worldwide!! 1. As it is a follower candy, Follow my Blog .... do it only if you like my work not just for the chance to win!! 2. Leave me a comment! Say anything that you like or dislike about my creations or just say "hello"
Candy will be open 'till July 8th,2012. Thanks a bunch for visiting my blog! All your lovely comments make my Day! I'm blessed to have such wonderful blog readers and friends!! I'm super excited to be the CFC GDT today!!! 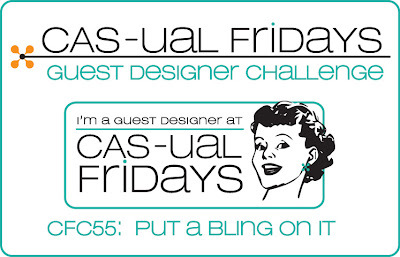 This week's challenge is with one of my favorite embellishment!! You all have seen me using it a lot on my creations. I used few of my new crafty goodies... stamps are HeroArts-Woodgrain and sentiment from HA/OWH-YEAR ROUND SENTIMENTS stamps set. I used lots of star and 2mm clear rhinestones from Pizzazz Aplenty. The Embellie Gellie and Best Glue Ever from Scraperfect makes it super easy to attach the teeny tiny blings. Finished it with some MayArts jute twine . 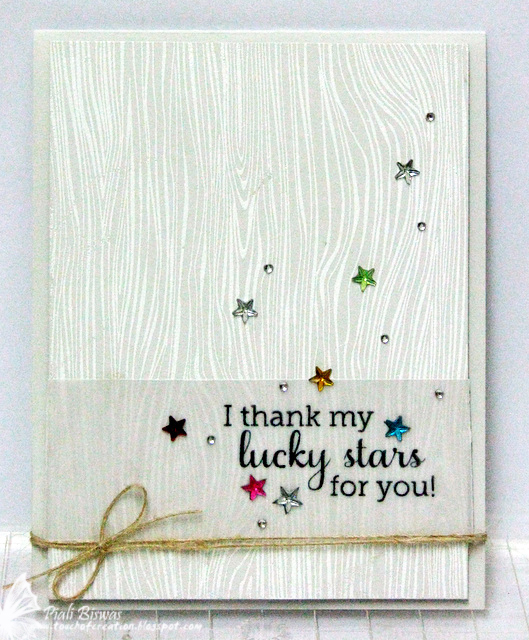 This card is also for LILY PAD CARDS- Star Challlenge. 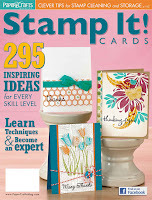 This week CAS-ual fridays challenge is sponsored by Simon Says Stamp. 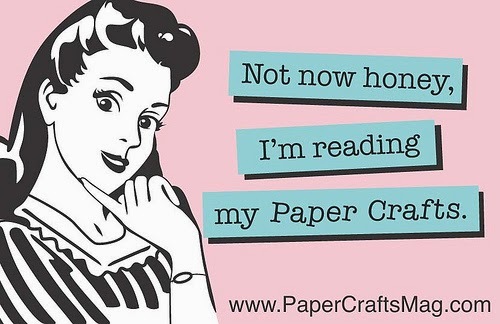 Its the best place to shop for latest & trendiest craft goodies...I love their international shipping rates, works the best for me. 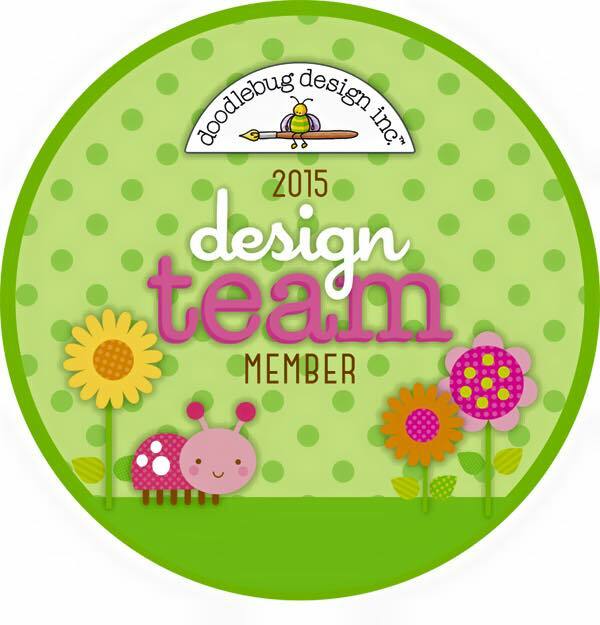 So go ahead and play along.....don't forget to post a direct link to your blingy projects HERE. I really had a blast creating with the uber talented group of crafters! !